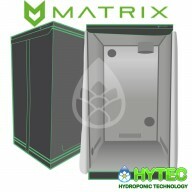 In the world of grow tents, there’s no turning back with Matrix Grow Tents’ unbeatable quality and value. Take the red pill and stay in hydroponics Wonderland! Reinforced Plastic Corners ,All quality branded tents tend to have plastic corners to prevent them going rusty,High Quality Zips A well-constructed, durable zip is non-negotiable. Nothing is more annoying than a broken zip! Up to 30kg Capacity,We’ve tested our tents up to 30 kg (per 1.5squaremetre) and we’ve found this to be perfectly sufficient. 600D x 300D Mylar Lined Fabric,Matrix Tents are made from 600D x 300D Mylar-lined fabric, giving them excellent resistance to tensile stress.12 Sizes now available ,Matrix Grow Tents offer more than a binary choice when it comes to size. With 12differentsizeoptions there’s a tent for every grow space! 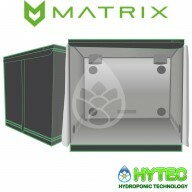 MATRIX GROW TENTS (S-M) Matrix is a high-quality, entry-level tent range exclusive to IKON International. The small to medium tent options start at 0.8m x 0.8m x 1.6m and range up to 1.2m x 1.2m x 2.4m in size. Sizes • 0.8m (w) x 0.8m (d) x 1.6m (h) • 1.0m (w) x 1.0m (d) x..
MATRIX GROW TENTS (L-XL) 2.4M TO 3.0M GROW TENTS Description Matrix is a high-quality, entry-level tent range exclusive to IKON International. The large to extra-large options range from 2.4 x 2.4 x 2.0m to 4.0 x 2.0 x 2.0m Size • 2.0m (w) x 2.0m (d) x 2.0m (h) • 2.4m (w) x 2.4m (d..